At the invitation of H.E. 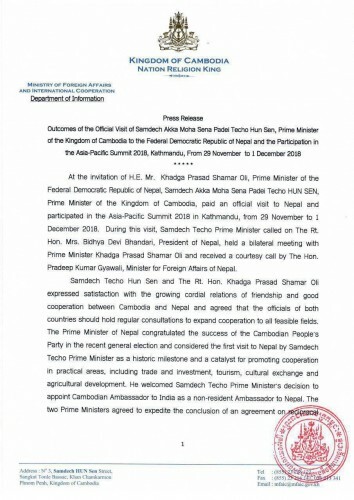 Mr. Khadga Prasad Shamar Oli, Prime Minister of the Federal Democratic Republic of Nepal, Samdech Akka Moha Sena Padei Techo Hun Sen, Prime Minister of the Kingdom of Cambodia, paid an official visit to Nepal and participated in the Asia-Pacific Summit 2018 in Kathmandu, from 29 November to 1 December 2018, according to the foreign affairs ministry’s press release dated 2 December. Following the official visit, on 01 December 2018, Samdech Techo Prime Minister attended the Asia-Pacific Summit 2018 in Kathmandu, where he made a key note address on the Summit’s theme “Addressing the Critical Challenges of Our Time: Interdependence, Mutual Prosperity and Universal Values”.